Note: This article presents one side of a disputed topic. See pro-spanking for the opposing view. 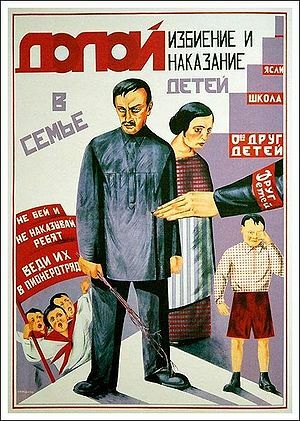 Soviet poster against the corporal punishment of children (1926). Anti-spanking is a term used to refer to the point of view that spanking is never an acceptable form of punishment of children. The opposite is called pro-spanking: the view that children should be spanked for certain categories of offenses. spanking does not work and makes behavior problems worse. Some people also argue against spanking from a religious point of view — for example, the Stop the Rod organization makes the claim "Jesus would have never hit a child". Politically, anti-spanking activists demand that the spanking of children should be illegalized in countries where it is still legal. In many countries their cause was already successful (see spanking of children). Recently, an initiative began called consensual adult spanking enthusiasts who are against the spanking of children. This cause has united many both in and out of the consensual adult spanking community. Consenting adult spanking enthusiasts have stated that while spanking is safe, sane, and consensual when practiced only amongst adults, it is extremely harmful to children. The anti-spanking movement began in Europe in the second half of the 19th century and gradually increased its influence during the 20th century. It caused a revolution in parenting and education methods that led to the complete banning of corporal punishment in many European countries. The anti-spanking position is expressed in most European parenting books that were published since the 1960s. Today there are many anti-spanking websites that are run by anti-spanking activists. The anti-spanking movement also grew influence in North America and on other continents since the mid-20th century, though to a much lesser degree. 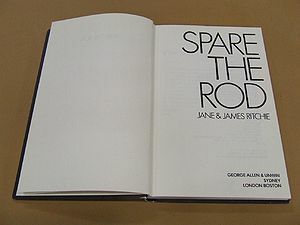 Spare the Rod by Jane & James Ritchie (1981). Anti-spanking parenting books are books on parenting that take an anti-spanking point of view, i.e. they recommend parents and teachers to never use disciplinary spanking, in no ways and under no conditions. Usually these books take the point of view that a spanking is always harmful for the child, irrespective of when and how it is given. Some anti-spanking books recommend other types of punishment, such as grounding or time-outs, while others go as far as calling any type of punishment wrong and potentially harmful. Most however try to draw their own line between methods they find unacceptable (including all forms of corporal punishment, usually, not only spanking) and methods they find acceptable. The first anti-spanking books are from the late 19th century, but the genre really boomed in the 1960s and 1970s, a trend which is still unbroken.